Pages: xii + 379 pp. Particularly for reconstructionist pagans, the availability and accessibility of scholarship and translations of ancient and medieval source-texts is essential to the understanding of and strides toward rebuilding premodern practices of the Greeks, Romans, Egyptians, and Germanic and Celtic peoples, amongst many possible others. Some of the most important studies in classical Mediterranean religions are published by E. J. Brill, and have been for the past few decades. Unfortunately, the selling prices of these (whether new or used) are high even for academic publications, and so one’s only hope in obtaining them is usually through a good university library. The present volume under consideration is an extremely useful one, and thus it is all the more upsetting that it is out of the usual price range for the majority of possible interested people, apart from the best-off affluent interested parties, or the most ardent and avid devotees of the subjects concerned who would be willing to spend nearly two hundred dollars on one book. The status of the “Orphic” gold tablets—short and cryptic ritual texts written on thin sheets of gold foil and found in a variety of funerary contexts in sites from ancient Greece, Italy, and Crete over the span of about the late fifth century BCE to the third century CE, but mostly from the 3rd and 4th centuries BCE—has been questioned in recent scholarship, but the authors of the present volume suggest through their studies here that they are definitely identifiable as fitting what is known of the Orphic sect in the ancient world, in comparison with the sect’s other known texts and what is conveyed about them in many other Greek and Roman authors. Their book presents each of the texts in turn in translation (and up-to-date editions in Greek or Latin are given in the first of two appendices), grouped by provenance and theme, and then each section of the text is discussed, both in relation to previous scholarship (and the authors’ survey of this is exhaustively comprehensive) and in terms of their new and evolving apprehension of Orphism. Most of the texts are somewhat like “crib notes” to the challenges faced by the (presumably) initiates who are the bearers or recipients of the texts, in the hopes that they will be aids to them for the approaching afterlife. The details provided in these texts include how a certain spring (of Lethe or “forgetfulness”) must be surpassed in favor of water from another spring (Mnemosyne, “memory”), which will then earn the initiate a favorable place in the afterlife; the declaration that one is “a child of Earth and starry Heaven, but my soul is of Heaven alone”; and various other passwords to earn the favor of Persephone and come under her protection and nurturance. Amidst and beyond these foregoing matters, there are many other interesting phrases (“a kid, I fell into milk”), images (the shining white cypress tree that is either the marker located by the correct or incorrect spring), and names of the deities (“Eucles and Euboleus,” e.g. Hades and Dionysos). One of the tablets—the “Great” Tablet from Thurii—is even described (p. 137) as a kind of “word-search” to confuse non-initiates! After the introduction and eight chapters dealing with the various tablets, the last chapters consider what the final destiny of an initiated soul in the afterlife would appear to be based on these sources (Chapter Nine), the extended consideration of whether or not these texts are genuinely “Orphic” (Chapter Ten), parallel Egyptian and Indo-European (Indian, Hittite, Iranian, and Gaulish) traditions of afterlife texts (Chapter Eleven), and finally an analysis of the possible literary models for the texts and their usage in ritual (Chapter Twelve). Following the first appendix that gives the editions of the texts discussed, a second appendix considers various iconographic representations of the afterlife, judgment scenes, Bacchic figures, and other ancient visual sources that may give parallels or which may even be depictions of some of the scenes and characteristics described in the current corpus of Orphic tablets. An excellent bibliography and indices round out the volume. The main drawback of this book, as mentioned previously, is its relative inaccessibility due to its price. I was not able to get a copy myself, and had to check it out from a nearby university library in order to read and review it. Anyone interested in Dionysos, Persephone and Hades, Orpheus and the Orphic philosophy/sect, ancient initiatory rituals and mystery traditions, and ancient Graeco-Roman-Egyptian religion and magic, would find this book very appealing and useful. 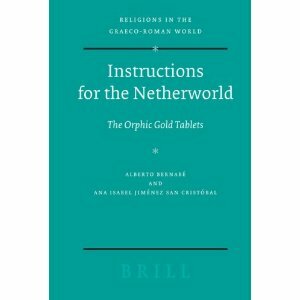 A more inexpensive alternative would be Fritz Graf and Sarah Iles Johnston’s Ritual Texts for the Afterlife: Orpheus and the Bacchic Gold Tablets (Routledge, 2007), which contains excellent discussion, texts and translations, and the history of scholarship on this corpus of materials. However, even if Graf and Johnston’s excellent book is obtained, I would still recommend that all of those who find this material useful, stimulating, and important or inspirational for their own practices to somehow get a hold of a copy of Bernabé and Jiménez San Cristóbal’s book to further their studies on this topic.